Newly delivered to an American working for the USA headquarters in France. Hence it's left hand drive and km counter in miles, the car is NOT from the USA. Rare manual with overdrive and in the - for many - most beautiful color ever created by Jaguar: Gunmetal Gray. Combined with lots of wood, black leather seats and a Webasto open roof. Restored in the early 2000’s in Hamburg at an astronomical cost. The ultimate luxury car with not only hydraulic servo steering and servo brakes but also rear wooden picnic tables and Michelin XWX tires (old but not used). Beautiful model, very nice presentation, drives well but before the car can be called reliable, a major maintenance is required. 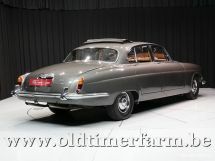 The Jaguar Mark X (pronounced mark ten) was the top-of-the-range saloon car built by the British manufacturer Jaguar, originally aimed at the United States market. The Mark X succeeded the Mark IX as the company's large saloon model. The modern Jaguar face, four headlamps set into rounded front fenders with a vaned grill, first appeared on the Mark X. 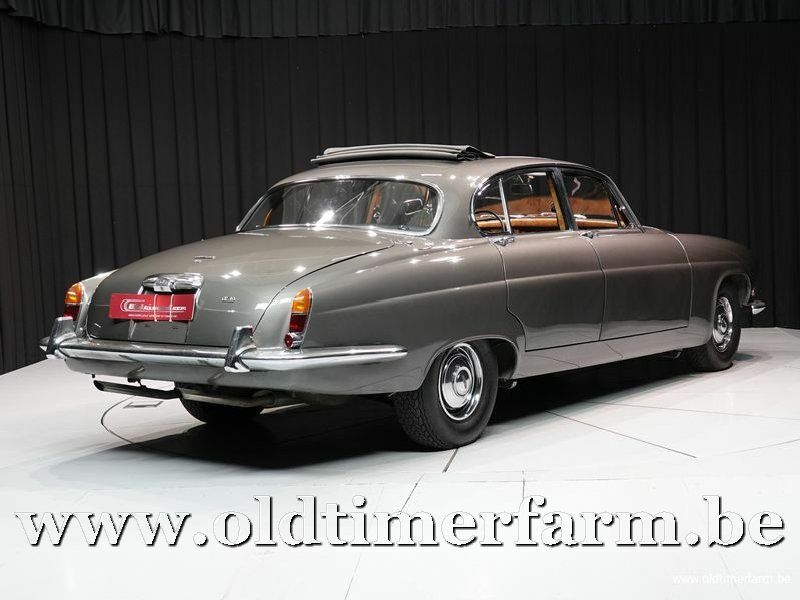 The interior is the last Jaguar with abundant standard woodwork, including the dashboard, escutcheons, window trim, a pair of large bookmatched fold out rear picnic tables, and a front seat pull-out picnic table stowed beneath the instrument cluster. Over time, air conditioning and a sound-proof glass division between the front and rear seats were added as options. From its introduction until the arrival in 1992 of the low-slung XJ220, the Mark X stood as one of the widest production Jaguars ever built. 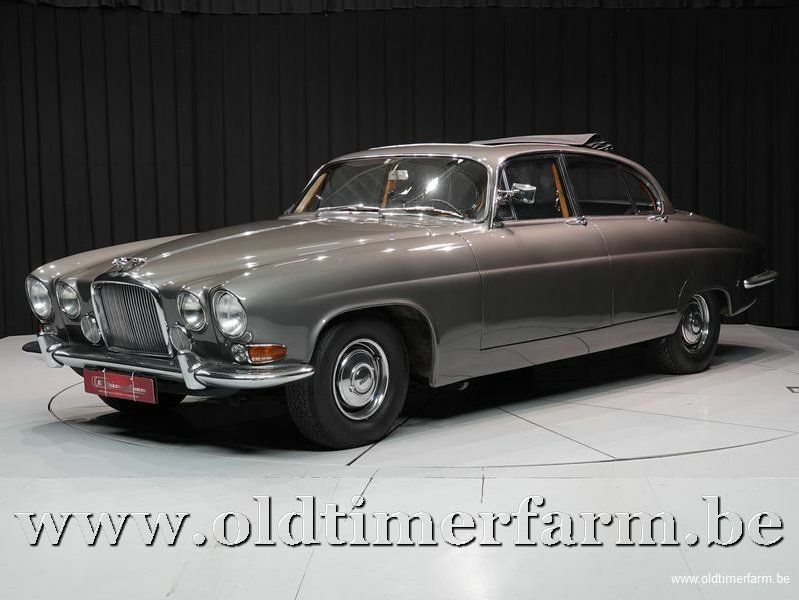 Asked in 1972 if he thought the Mark X had grown rather too large, Jaguar chairman William Lyons, agreed that it "definitely" had: he opined that the then recently introduced and notably more compact Jaguar XJ6 was, by contrast an "ideal size". The substantial doors required helical torsion springs inside the door pillars to enable them to be opened from the inside with an acceptably low level of effort. The Mark X was the first Jaguar saloon to feature independent rear suspension. It used a wider-track version of Jaguar's IRS unit first seen on the E Type, which was subsequently used on Jaguar vehicles until XJ-S production ended in 1996. Front suspension used double wishbones with coil springs and telescopic dampers. Initially Jaguar's XK in-line six-cylinder engine was featured, with 3781 cc. A 9:1 compression ratio was standard, but an alternative 8:1 compression ratio was available as an option. For the London Motor Show in October 1964 the enlarged 4,235 cc unit took over, although the 3.8-litre unit could still be specified until October 1965. Triple SU carburettors were fitted, fed from an AC Delco air filter mounted ahead of the right hand front wheel. Transmission options were manual, manual with overdrive, automatic or automatic with overdrive. The arrival of the 4.2-litre power unit coincided with the introduction of a newly developed all-synchromesh four-speed gear box replacing the venerable box inherited by the 3.8-litre Mark X from the Mark IX which had featured synchromesh only on the top three ratios. Many domestic market cars and almost all cars destined for the important North American markets left the factory with a Borg Warner automatic gear-box. The 4.2-litre engine's introduction was also marked by a transmission upgrade for buyers of the automatic cars, who saw the Borg Warner transmission system switched from a DG to a Typ-8 unit. The power train was completed by a Thornton Powr-Lok limited-slip differential. Stopping power for this heavy car came from power-assisted disc-brakes on all four wheels. Power-assisted steering was standard, the later 4.2 cars receiving Adwest Varamatic variable ratio steering boxes.